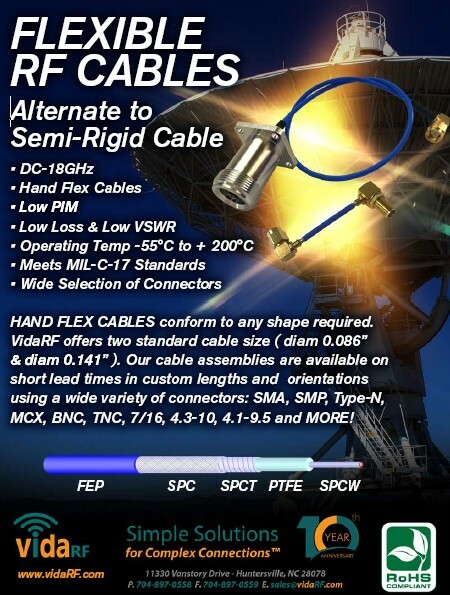 Huntersville, North Carolina - September 12, 2017 - VidaRF offers DC to18 GHz hand formed semi-flex cable assemblies. The outer shield is copper braid, silver plated to minimize signal leakage and maintain flexibility for ease of bending to your requirement. Option to include insulated clear or blue jacket reducing risk of shorting. Available in a wide variety of connector combinations. Excellent return loss and insertion loss.